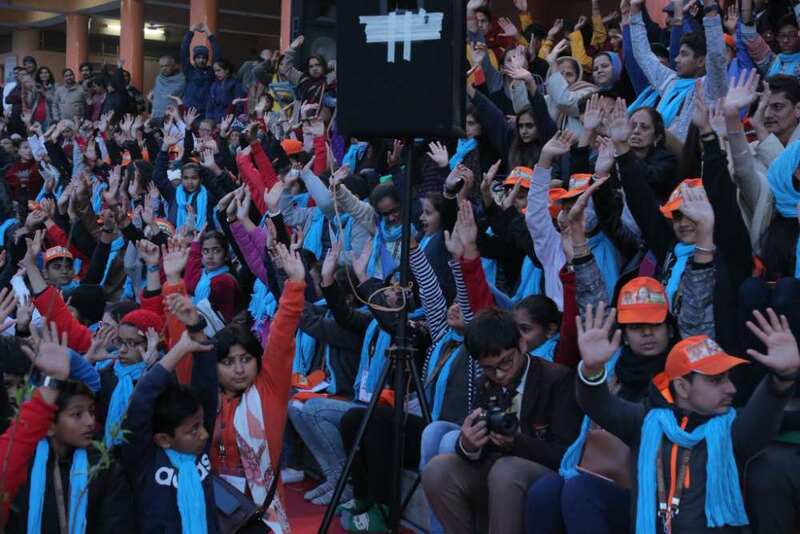 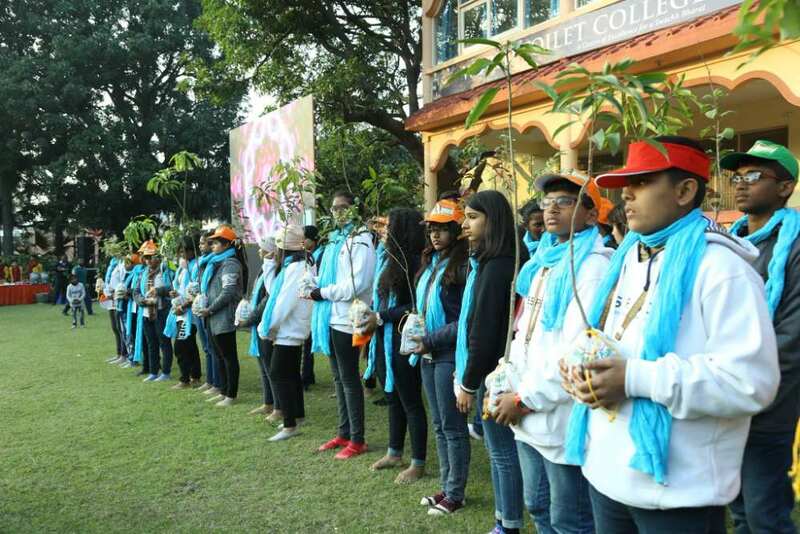 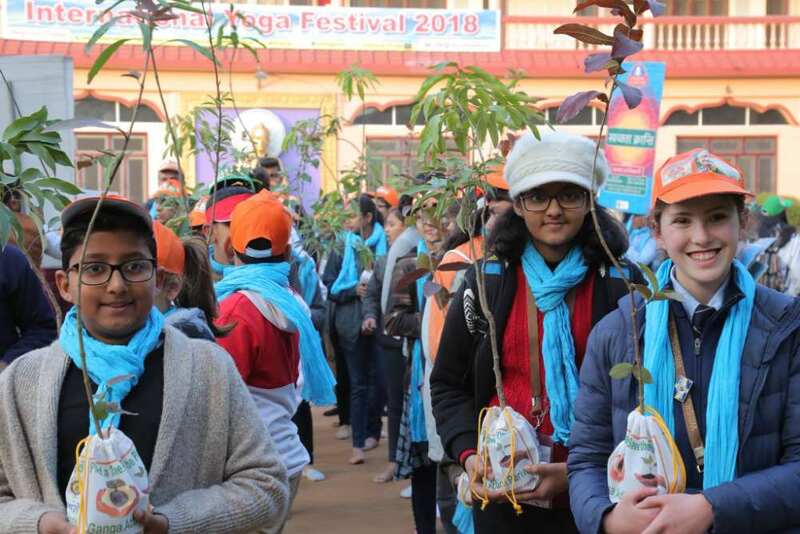 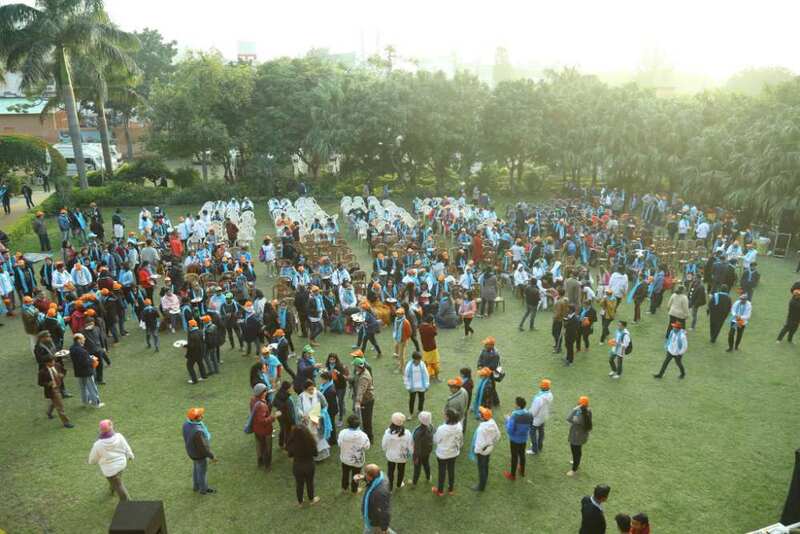 The Global Interfaith WASH Alliance​, Divine Shakti Foundation​, Ganga Action Parivar​- Parmarth Niketan​ were proud to host nearly four hundred students, between the ages of 13-14, from the Round Square​ Global Conference for an inspiring Environmental Pledge yesterday. 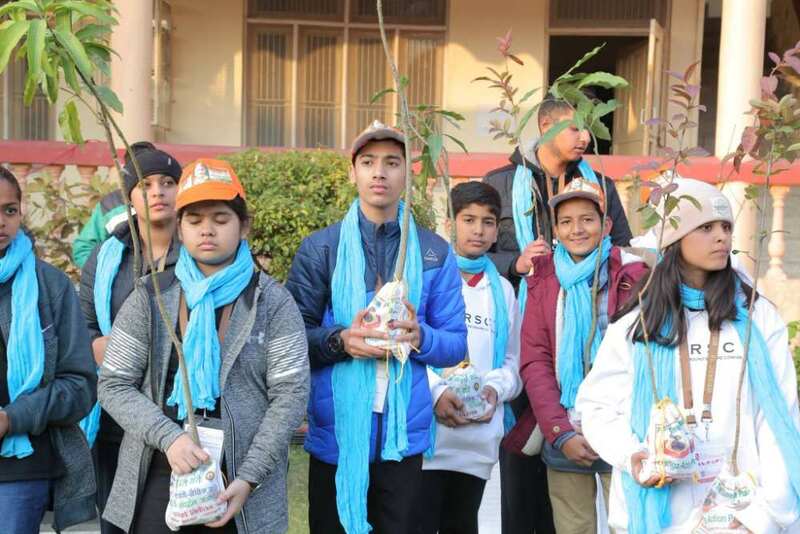 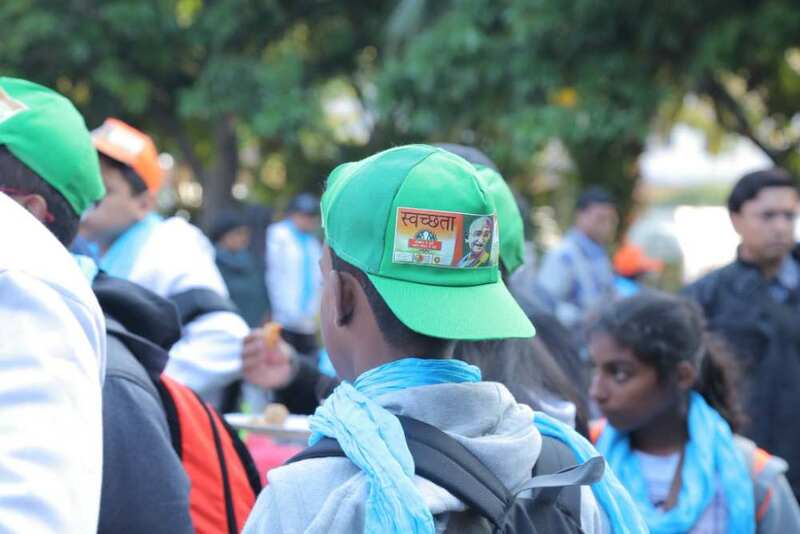 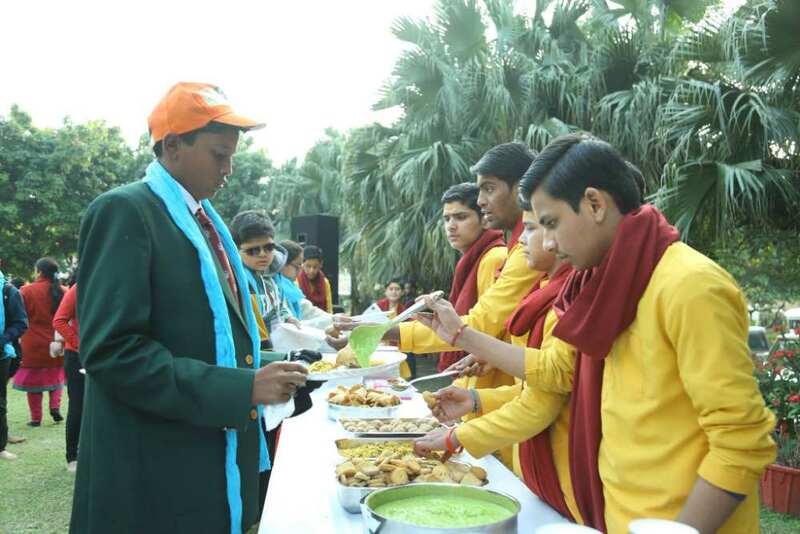 The event was planned in association with the Welham Boys’ School (WBS), who had organized an intense 3-4 days of activities outside of this event. 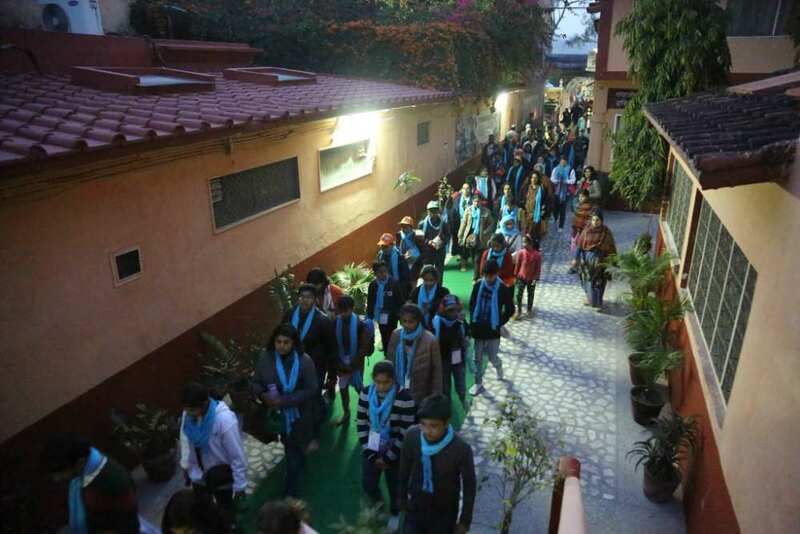 The theme of the conference was Escape the Ordinary. 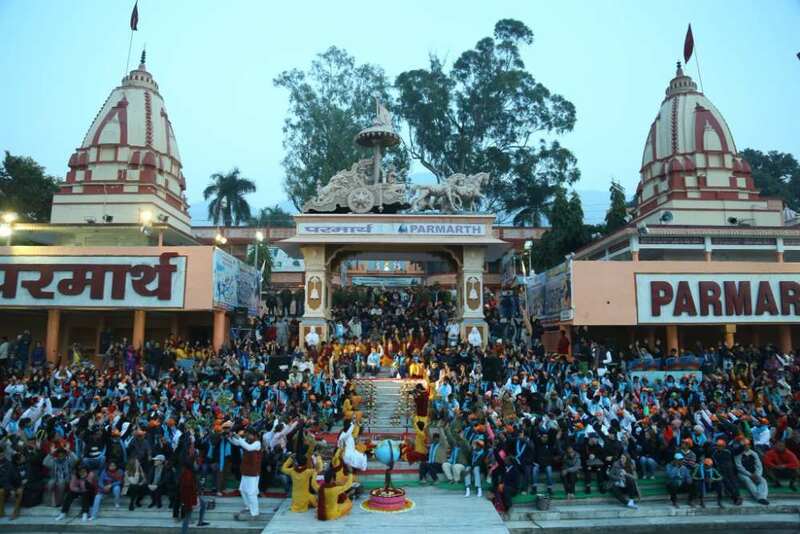 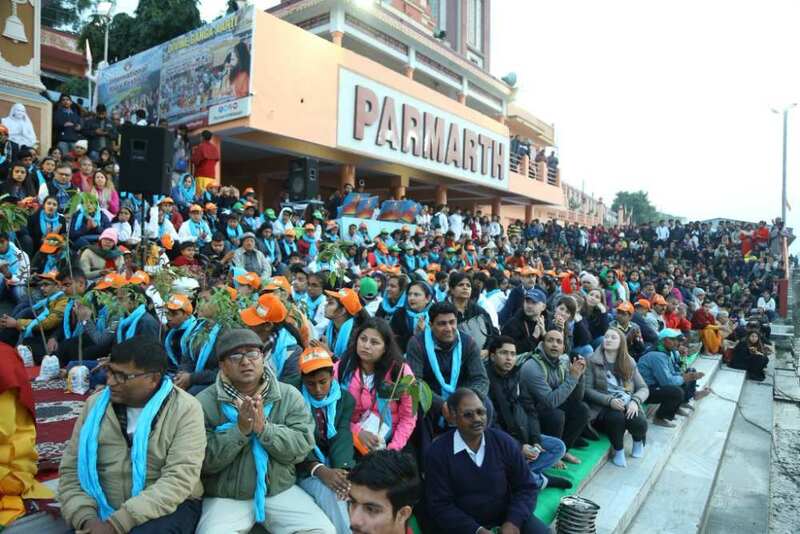 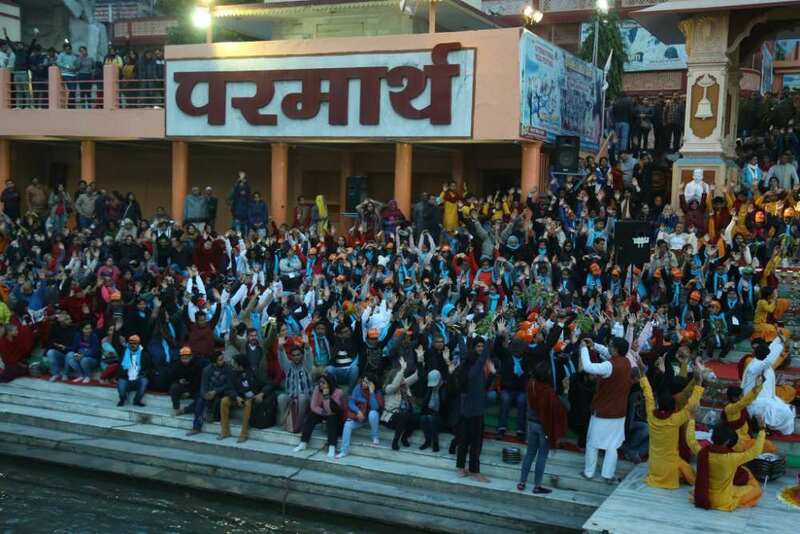 The event was planned with the inspiration and blessing of HH Pujya Swami Chidanand Saraswatiji, President of Parmarth Niketan, whose tireless efforts to protect the environment and maintain the clean and free flow of the sacred River Ganga and her tributaries is a great motivation to people from every corner of the world and from diverse walks of life. 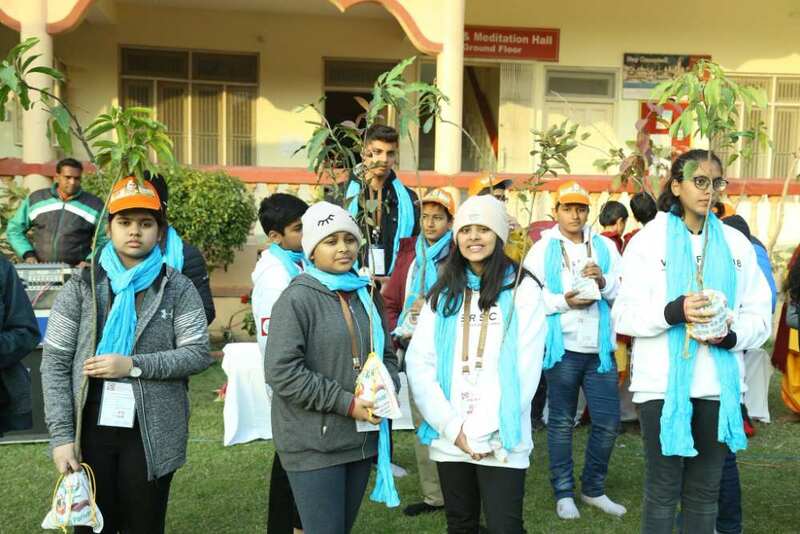 The student delegation was from all over India and the world, including, China, Brazil, America, the UK, Oman, Singapore, Dubai, and many other countries to engage in a pledge to protect our planet and to improve water, sanitation and hygiene for every child. 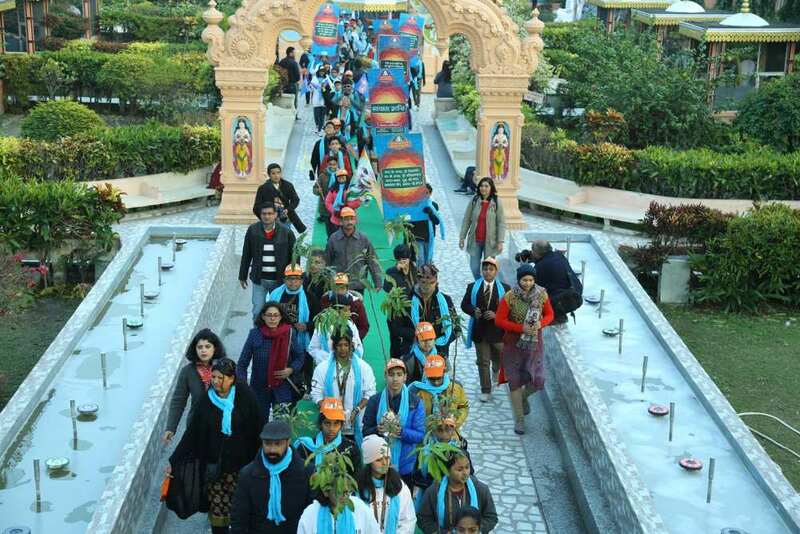 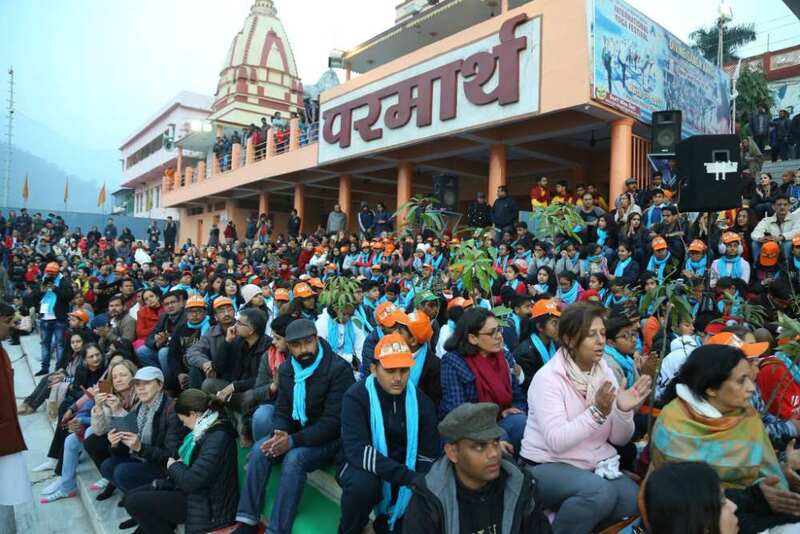 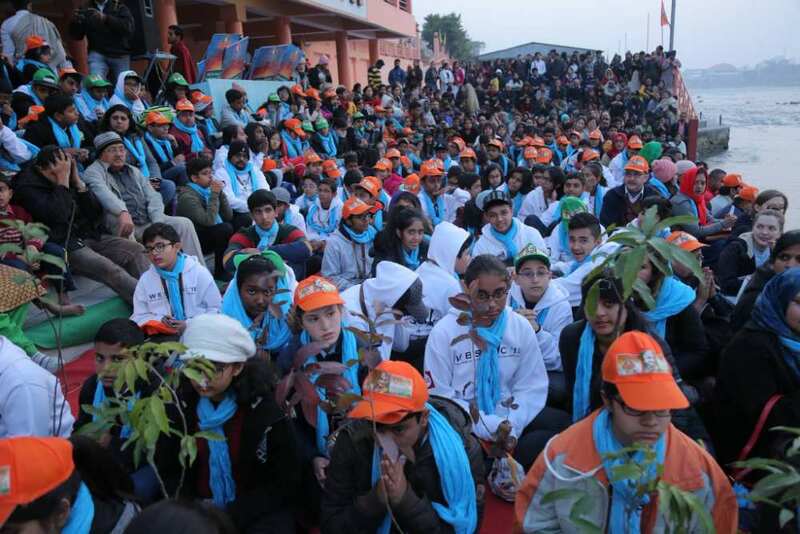 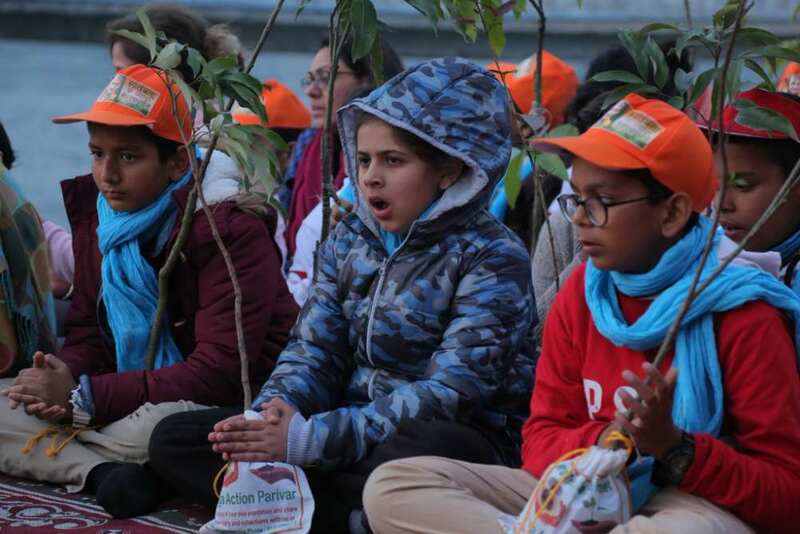 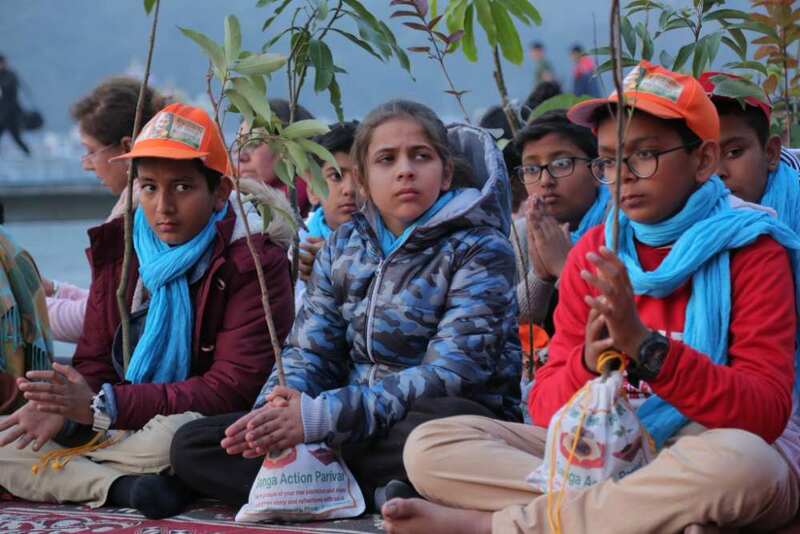 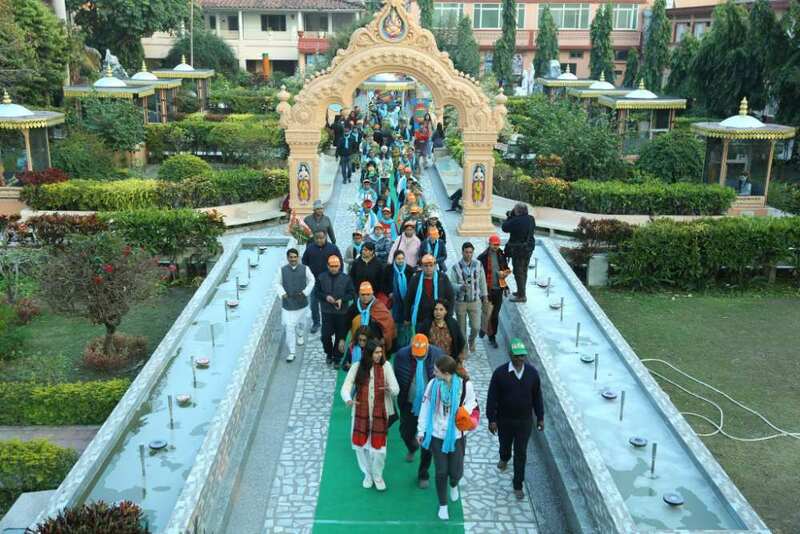 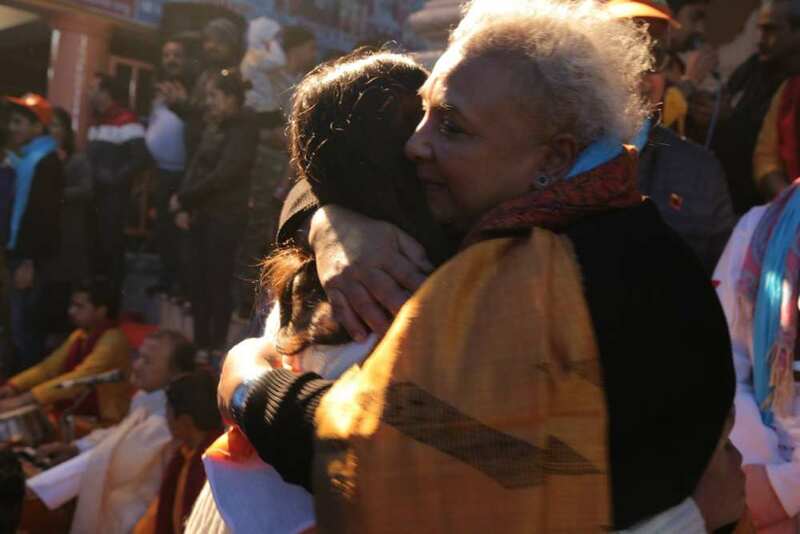 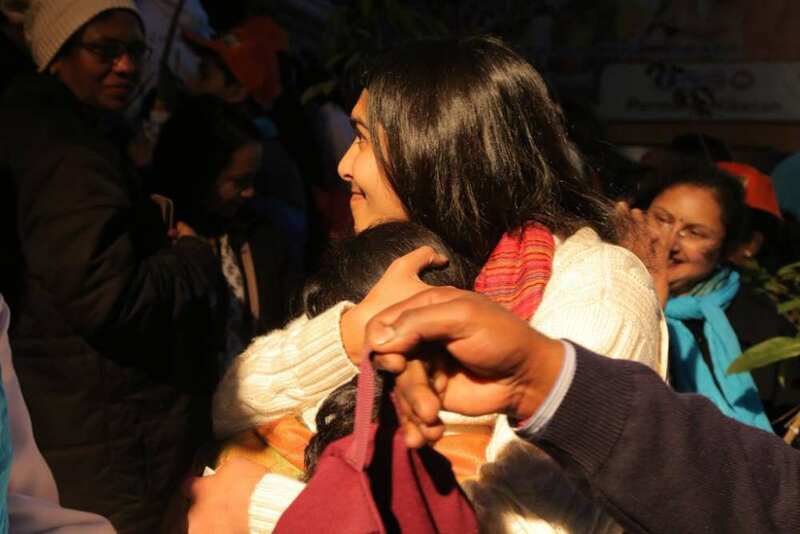 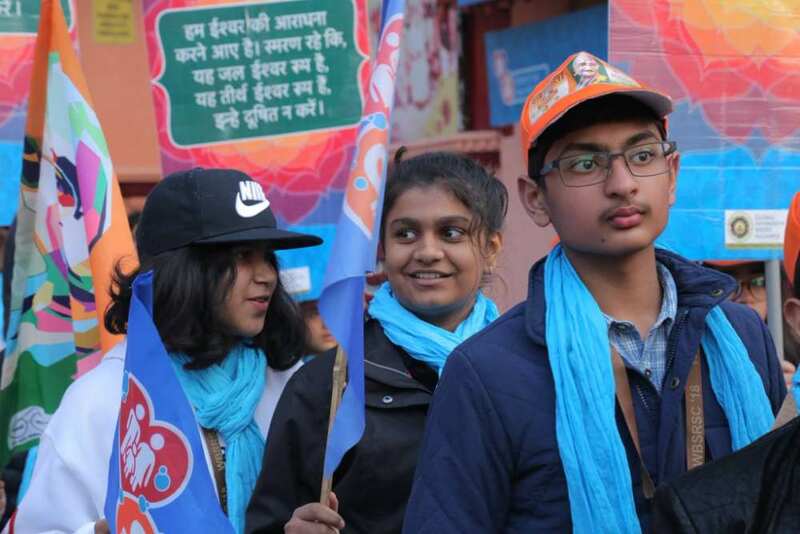 They were also blessed by short messages by Pujya Swamiji and Sadhvi Bhagawati Saraswati​ji welcoming them home and inspiring them to take their time on the holy banks of Mother Ganga as a motivation to be Clean and Green Ambassadors of our Planet. 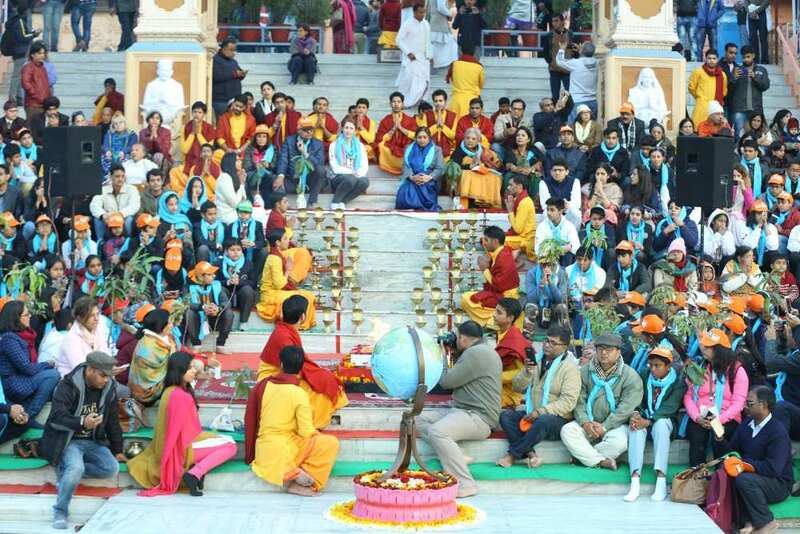 The day’s events included a festive and colourful environmental procession from the Parmarth Yoga Garden’s to the Parmarth Ganga Ghat in which Parmarth’s Rishikumars, visiting Buddhist Nuns from the Mahabodhi International Meditation Centre and the Lohiya Swachh Bihar Abhiyaan delegation, on a three day special conference at GIWA’s World Toilet College located within Parmarth Niketan, as well as colourful puppets took part. 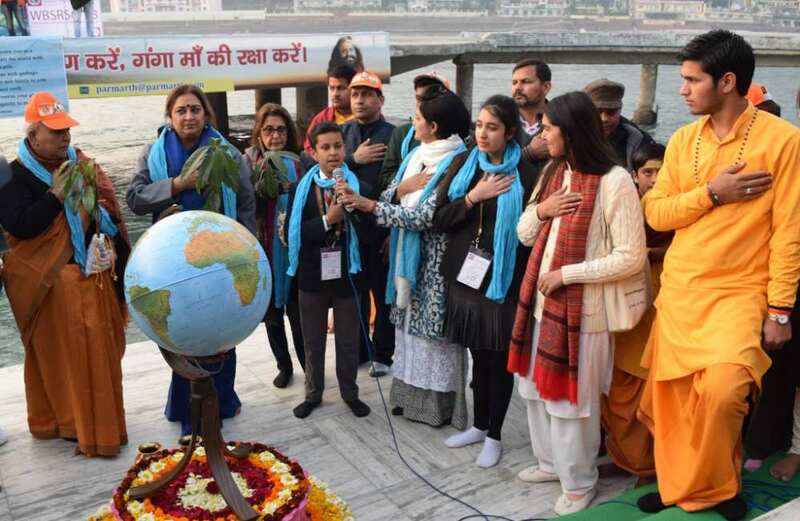 Once arriving to Parmarth’s majestic Ganga Ghat, the delegates took part in a beautiful water blessing ceremony, in which they offered sacred water to the globe as a prayer and a pledge that children all across the world should have access to safe and sufficient water. 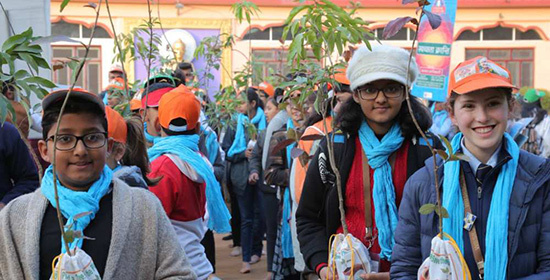 The students were given 50 fruit tree saplings as a symbol of GIWA and GAP’s mid-day fruit programme wherein every child was inspired to plant fruit trees in their schools so that they can not only protect the environment, purify the air, prevent soil erosion but also enjoy the fruits from these trees to prevent malnourishment in their own bodies. 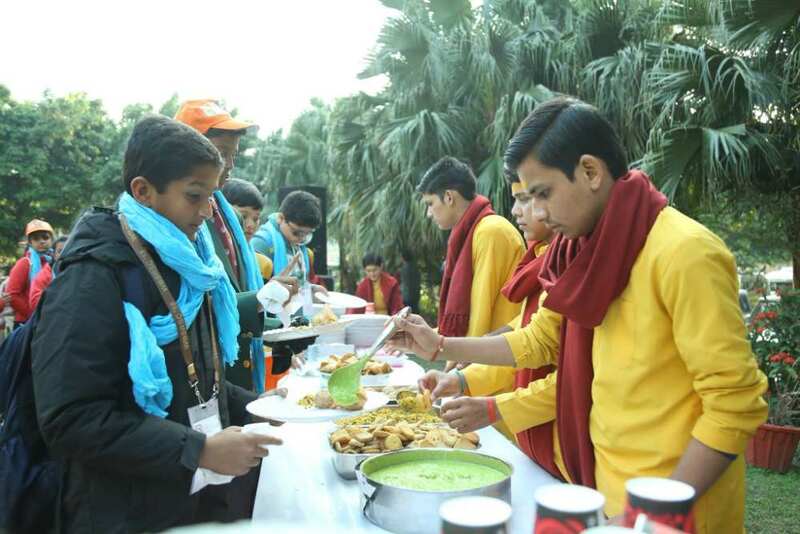 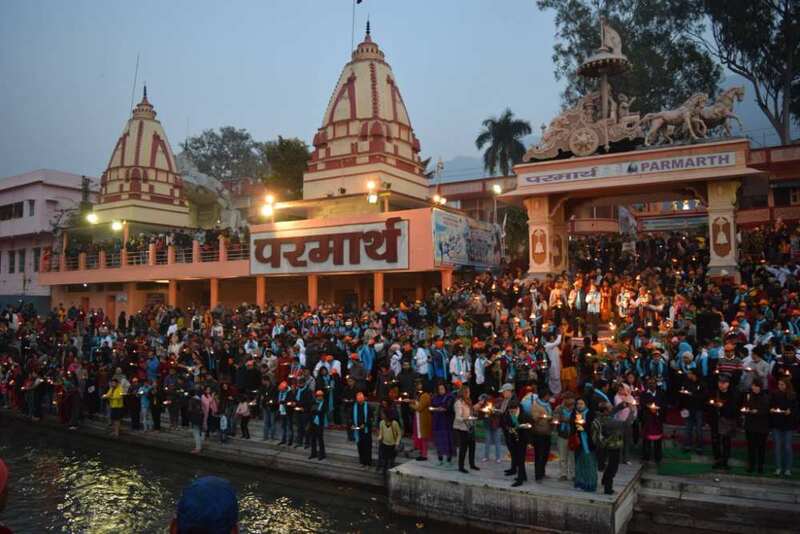 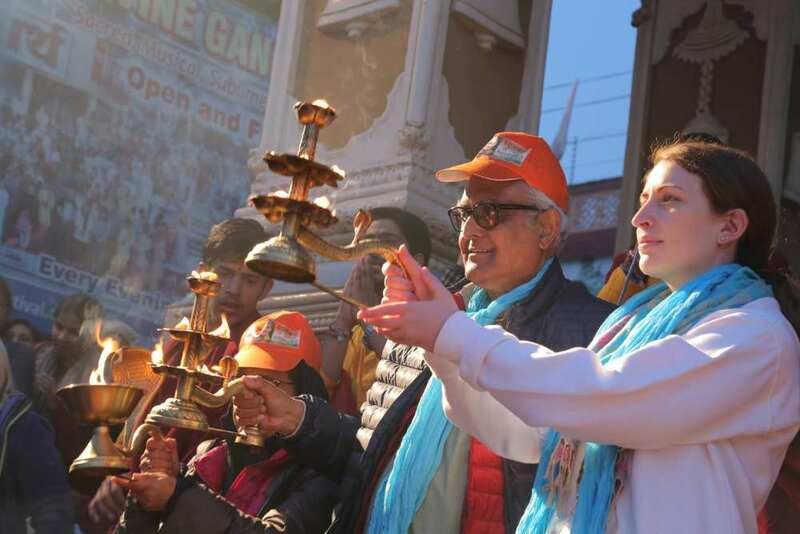 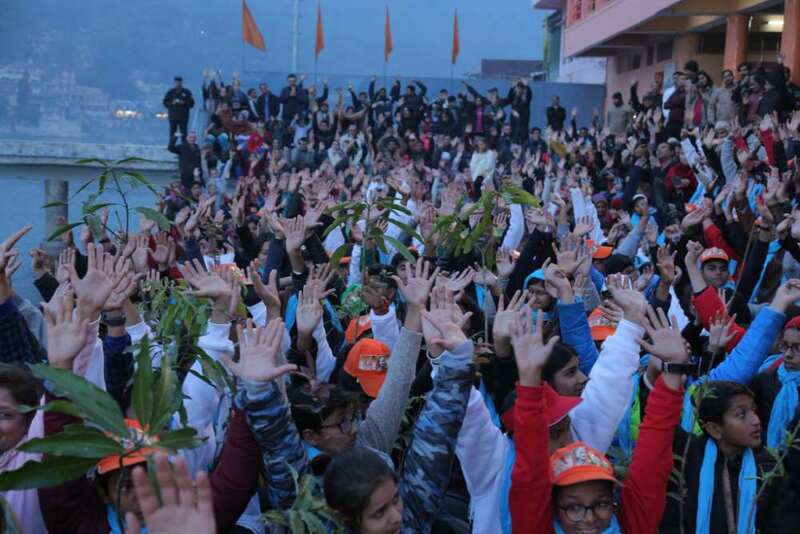 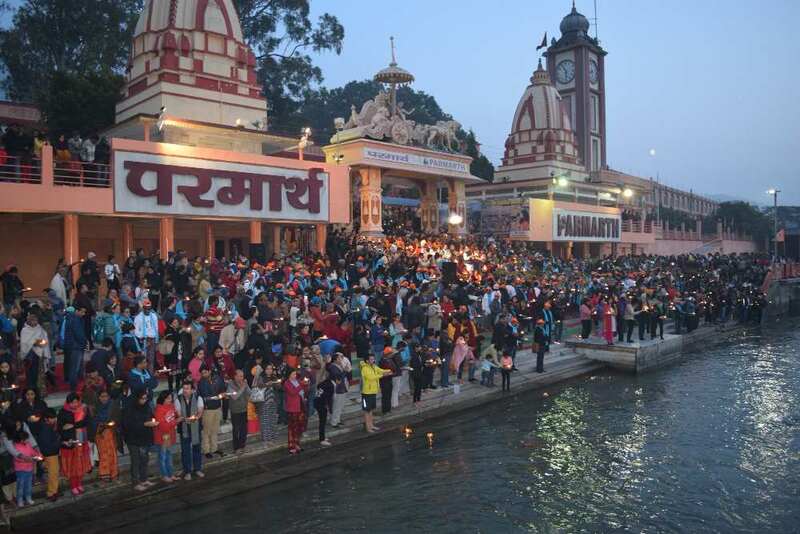 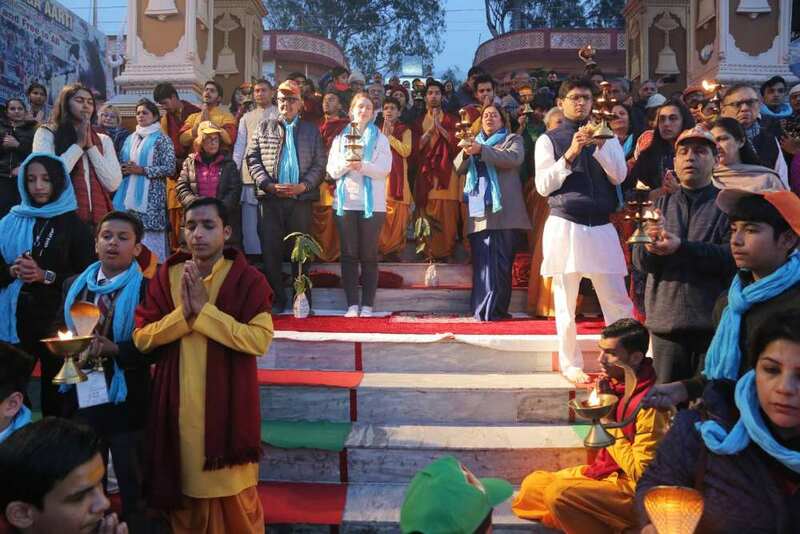 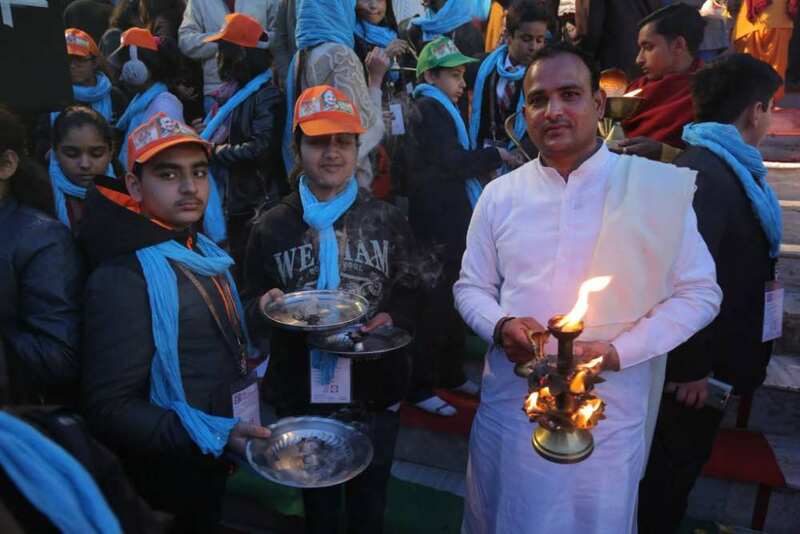 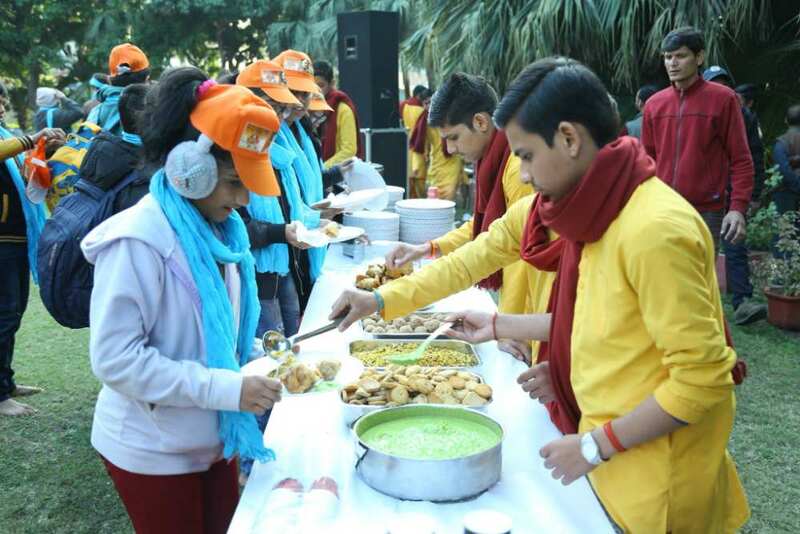 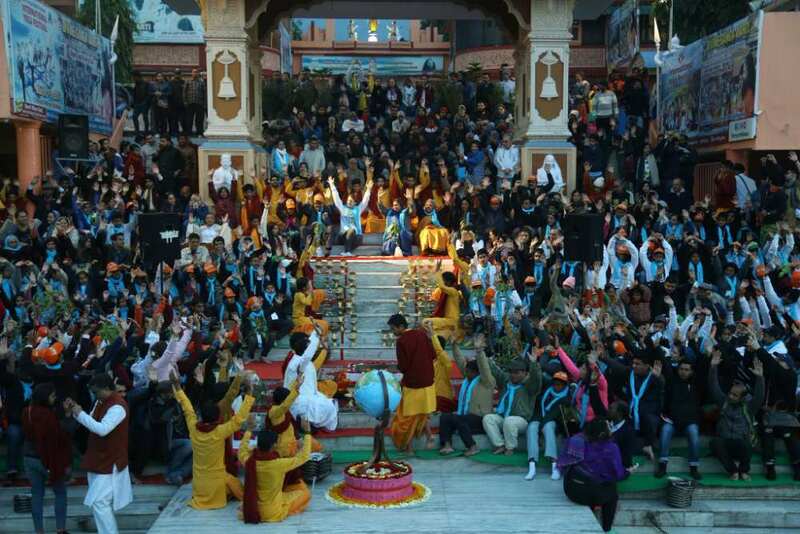 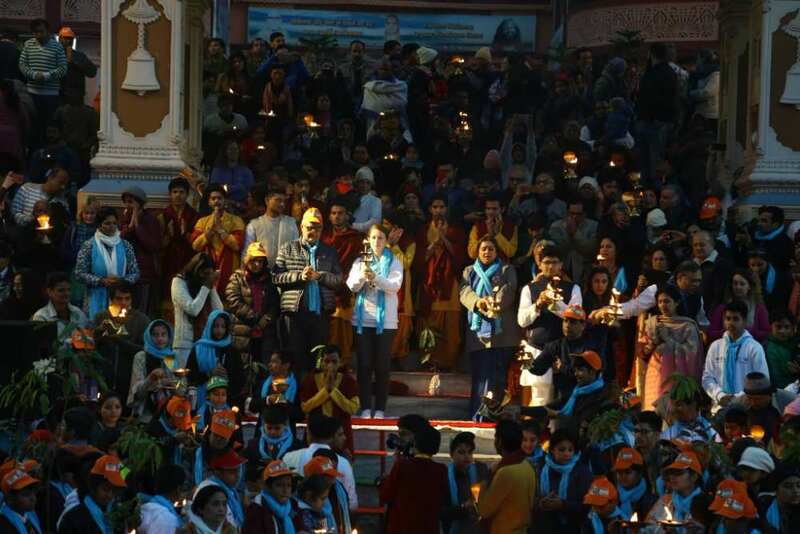 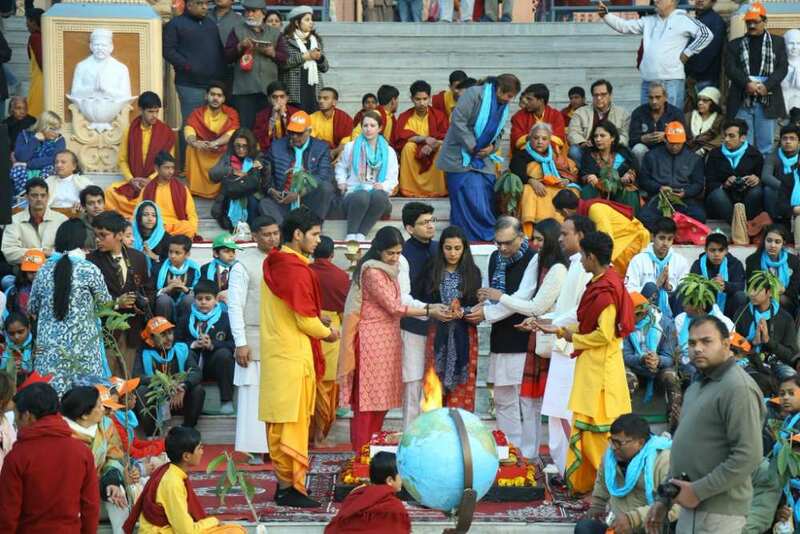 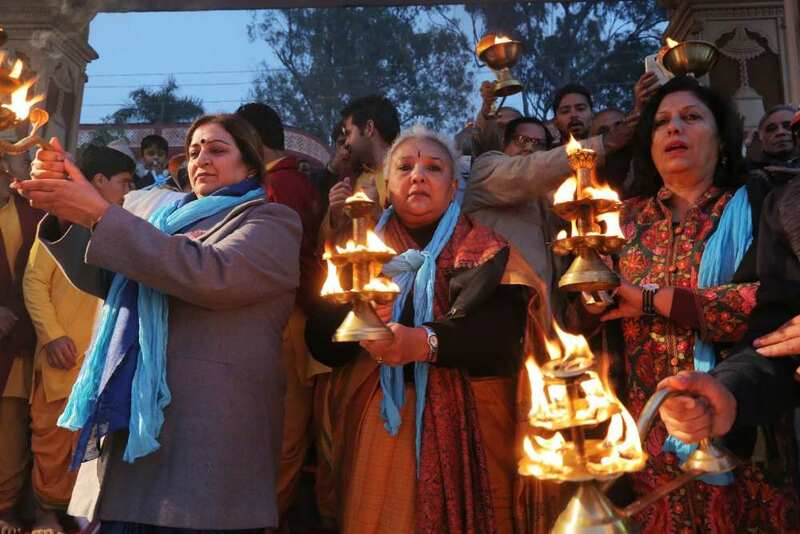 The students also took part in the world famous divine Ganga Aarti ceremony. 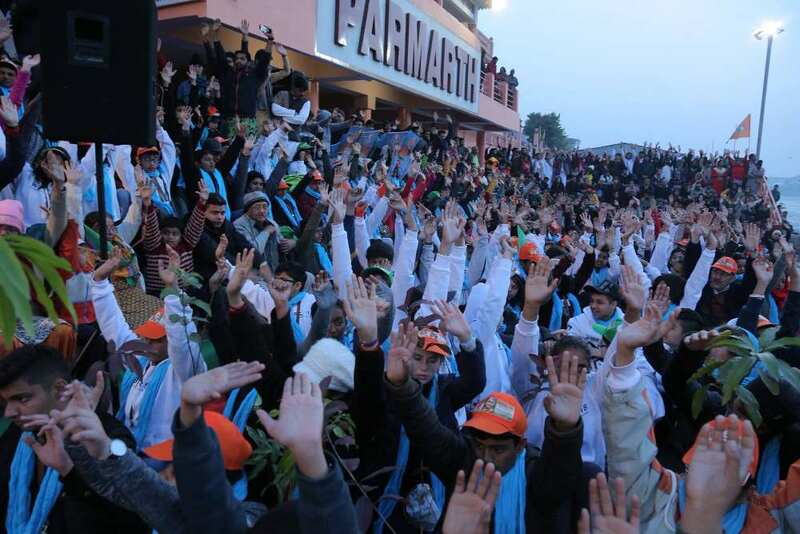 Their visit to Parmarth was the highlight of their experience and the pledge deeply moved them.